One of the things that allowed primitive man to spend less time on sustenance and to extend the range of edible foods was the ability to cook - this depended on lighting fires and later on, crucially, the development of pottery and metal to create containers for cooking. Modern man (and women) take this for granted but we have mostly moved away from burning wood and instead we cook at home using gas or electricity. 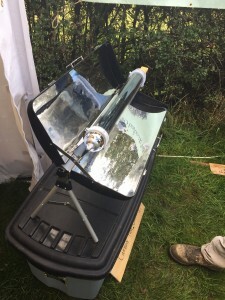 Woodland campers often go back to ancient methods of cooking by lighting fires, but there is now a modern off-grid solution which is a solar powered cooker. This particular device uses the radiation from the sun just like a domestic solar thermal installation which produces hot water. The sun's rays are concentrated on a cylinder which is surrounded by a vacuum tube. To make it work well you need to point the device towards the sun - a small vertical pin helps you to to know when you have it optimally positioned. So the key to solar cookers is threefold: concentrating sunlight, converting it to heat energy and trapping this energy. 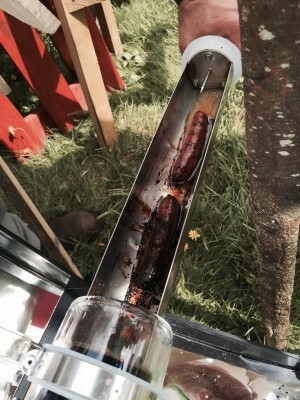 Inside the tube-shaped cooking tray you put your sausages, kebabs, potatoes or even dumplings and within about 15 minutes sausages will become nicely cooked. 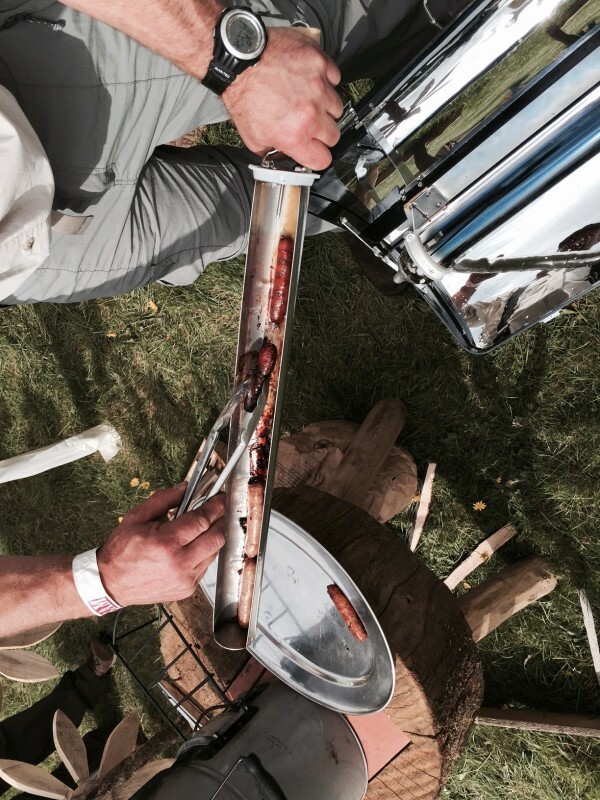 As my friend Rich warned, "you go away for 20 minutes in a bright sunshine and the sausages will get burnt, so be careful!". This solar cooker folds up into a small case and is light to transport (about 3-4 kg) so apart from cooking in woodlands you can also use it at the beach. This particular model ((in the adjacent image) is made by slicksolarstove.com and costs about £125. Of course night-time cooking is problematic with solar energy and some winter weather can be an obstacle but as with all solar power one has to remember that what you need is radiation rather than warm weather. In many countries nearer to the equator the sun shines on most days and solar cooking is becoming very widespread, especially in rural areas. In China there are already well over half a million solar cookers and even Tibet has about 70,000. Initially these were subsidised but apparently they now sell without subsidy at about $60 each. Often the concentrator type are used with large parabolic dishes. The fact that the sun is free means the costs are soon recovered through saved fuel costs.